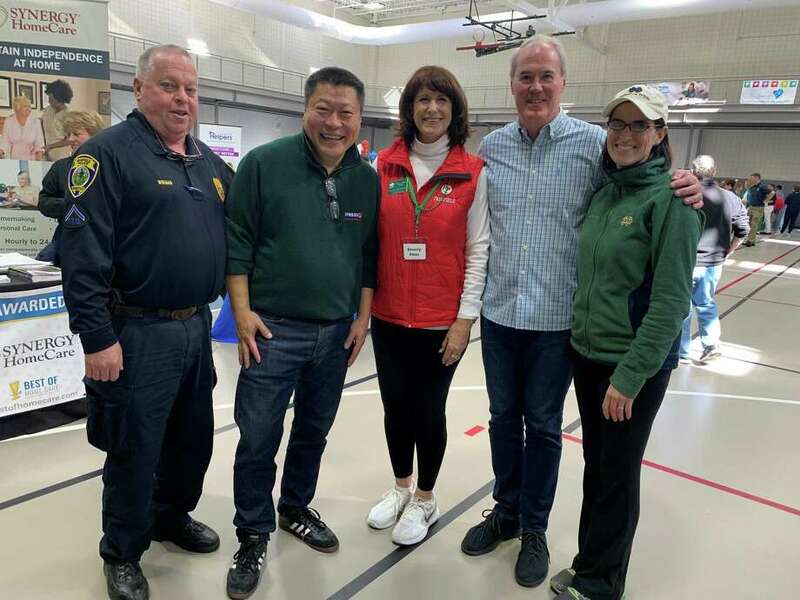 From left, Officer Gary Wickman, Senator Tony Hwang, Executive Director of the Fairfield Chamber of Commerce and event host Beverly Balaz, Event sponsor Jack Collins and state rep Cristin McCarthy Vahey participate in the fifth annual Expo. FAIRFIELD — The Fairfield Chamber of Commerce, in partnership with the Town of Fairfield, held its fifth annual Fairfield Health & Fitness Expo, promoting community wellness. Held in the RecPlex at Fairfield University on March 16 and sponsored by Collins Medical Equipment, this free, annual event provided health, fitness and fun for the entire family. More than 85 participating exhibitors and hundreds of community members participated. The event was organized by a committee of local business leaders along with the chamber President Beverly Balaz and event sponsor Bryan Collins. Exhibitors demonstrated information on programs, services, and products, provided free health screenings and fitness demo’s (by DOJO Fairfield, Fairfield YMCA, Elliptical Studios, Fairfield Strength, Club Pilates Fairfield, Row House Westport), followed by question-and-answer sessions. State Rep. Crisitin McCarthy-Vahey also attended the event. “This is a great event for we exhibitors, members of the chamber who can expose their businesses and also for the population to get out here and get information and resources from,” said Paul Doyle, owner of Oasis Senior Advisors. A Shamrock Fun Run and Popsicle Stick Challenge by SoundRUNNER, Touch-A-Truck, Kids Crafts, Hands-Only CPR & AED Training, a Prescription Drug Take Back operated by the Fairfield police and Fairfield Health Department, local Girl Scout Troops selling cookies and Food Vendors added to the event.